Established to ensure the generation of skilled manpower in the sector, create career paths in roles existing within the unorganized and organized segments of the Beauty and Wellness industry and ensure active participation of the different stakeholders i.e. Industry, Academia and learners to ensure a holistic development of skilled manpower. India was listed as one of the top 20 Spa countries worldwide. Combining the benefits of Rejuvenation & Alternate Therapy services along with holiday packages has become increasingly popular. Moreover, Ayurveda , MedSpa, Natural and Resort based Spa rejuvenation centers are estimated to contribute over 30 percent of the total income in the tourism industry. Yoga and meditation courses have also attracted the attention of the tourists and travelers. 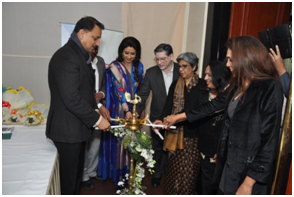 India is currently the 10th fastest growing market globally in Beauty & Wellness sector and the industry is poised to reach a size of INR 875,000 crores by the year 2014. 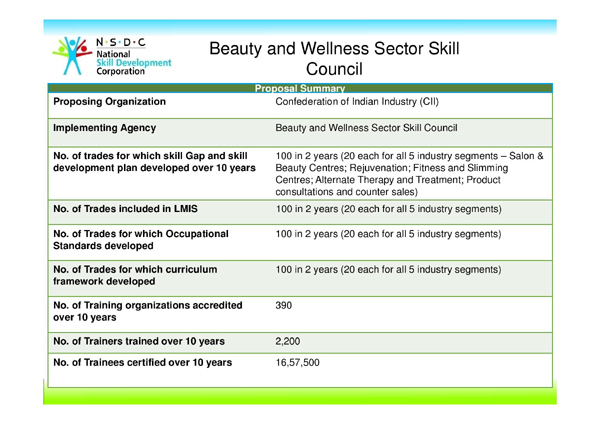 I want starting you Beauty & Welness course in our NGO.So i already sent our organization profile in your email ID on kakoli.rc@bwssc.in after discussion with mrs kakoli roy chowdhury.but unfortunately not response till now.please reply us. we have also working in this trade. I want you Beauty & Welness course in our institue so please send me details . Thanks SATYENDRA TIWARI C. G.